In side-stepping the more traditional use of a straight razor to shave – one of the greatest debates when it comes to shaving is whether to use a safety or cartridge razor. Neither model is abominable – hence the ongoing debate – but it’s worth knowing the pros and cons. That is, why does it matter so much what kind of razor you use? The answer is that, as you may know from browsing for the best beard shaver, a good shave matters. As does the difference between a good shave, and a great one. While picking out the best beard vitamins and supplements is important for keeping up with your beard grooming routine, you also can’t neglect the importance of finding a razor that will be able to do right by you. Having your best beard grooming collection stocked for use can only get you so far. To help you decide what kind of razor will give you a better shaving experience, and drop our own two cents in on the grand safety versus cartridge debate, we have the low-down on both shown below to enlighten you on each’s benefits as well as how to use them. Before making the decision of what kind of razor you want to purchase, it’s a good idea to gather an understanding of what each look like and can offer. There are two types of safety razors: single edge and double edged. 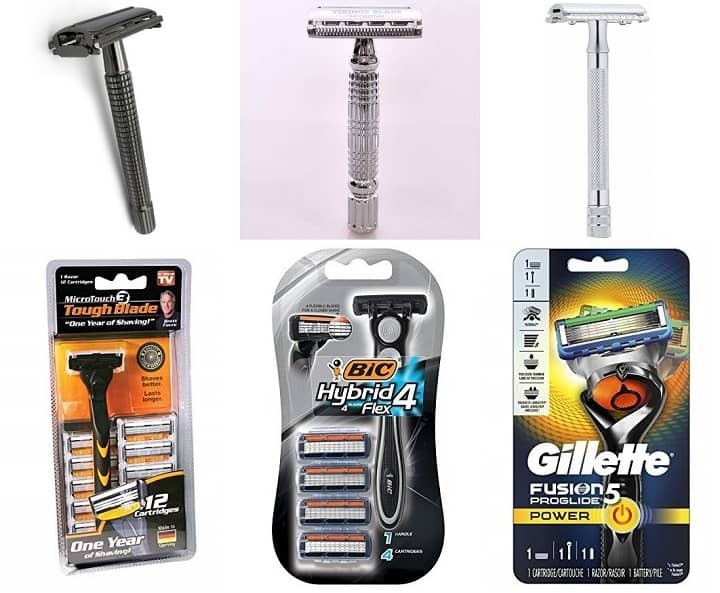 However, because most manufacturers have stopped producing the former, you’re more likely to find the more popular double-edged (DE) varieties when searching for this type of shaver online or in stores. The difference between the two varieties is their blades. Single-edge tools have sharper, thicker, and more aggressive blades. On the other hand, double-edge models are largely considered the superior variety as they are manufactured with safer blades, and because they allow for a faster shave. They feature a metal handle that can range in length and double-edged razor blades with a safety bar situated underneath in order to make the device practical and safe for angled usage. If you’re looking for the best razor for sensitive skin, you’re going to want to opt for a safety razor. 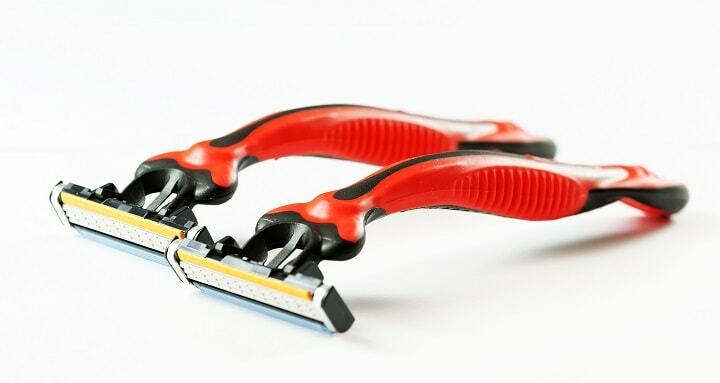 Razor burn can famously occur by using an ill-maintained razor with dull or clogged blades, but because of the head and blade design, they are more adequately equipped to help you reduce the likelihood of this occurrence. Although a good quality safety razor will cost more than a cartridge model upfront, you’ll save more money down the line when it comes to replacing its blades. Even the best safety razor blades won’t break the bank. Not going to lie, safety razors look a lot cooler than your general Gillette. They’re classy, without the Sweeney Todd style of a shavette, and a little nicer to show off in your bathroom alongside your best beard butter. With their sharp blades, safety razors are impeccably designed for smooth, close shaves. With a lesser chance of irritation, you can use the best face wash for men without worrying about additional redness when or if you are using the safety razor on your face and neck areas. 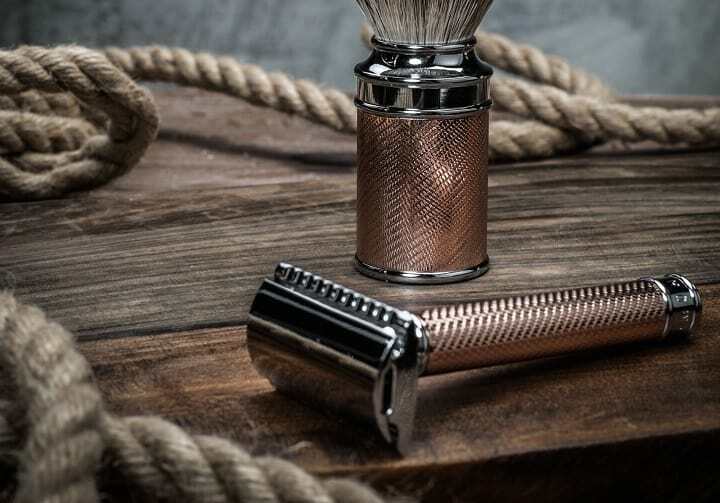 Generally, the considerations that largely dictate what safety razor you’ll want to buy will be cost and your personal skin sensitivity, as well as things like beard type and hand size. You will want to look for a shaving tool that will fit right in within your usual maintenance routine of washing with your best beard conditioner. Safety razors can be intimidating to first-timers with their sharp blades, but as long as you set aside some extra time to really pay attention to each stroke, you won’t need to use a styptic pencil on the regular. If you have larger hands, you’re probably not going to want to choose a model with a short handle. However, the length and weight of safety razors can vary based on the brand, and it’s really your decision as to what you’re more comfortable shaving with. 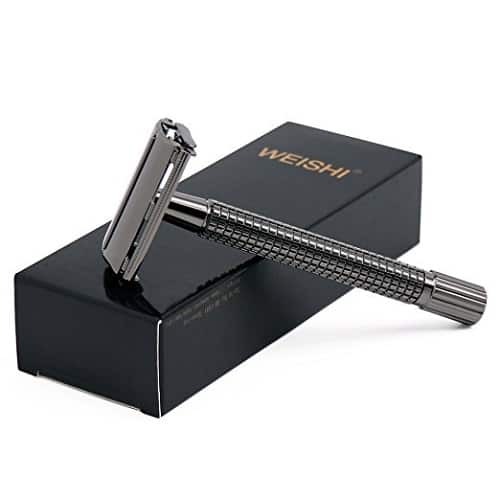 The amazing thing about WEISHI Double Edge Safety Razor is the simple butterfly mechanism that makes setting up the razor one of the easiest things ever. Twist the bottom and the safety razor will open at the top, drop the blade in and then twist it to close it – it’s as simple as that. Be sure that this locking mechanism will remain tight and secure. 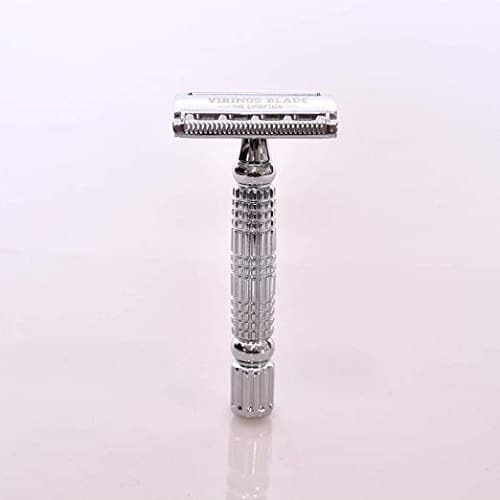 Perfect for beginners and intermediate level shavers, this safety razor is pretty forgiving, yet gives you one of the closest shaves of your life with no razor bumps at all. Non-slippy, with a textured base, the long handle of this razor is extremely easy to hold even with the wet hands without fearing that you will accidentally drop it. Of course, the crucial thing are the blades, which are in this case exceptionally sharp but can make you cut yourself easily. However, their quality is not that great and they tend to rust quickly. This shouldn’t worry you as the cost of the replacement ones is a bargain deal, plus the used ones are recyclable. Keep your safety razor clean from the soap residue by rinsing it off every once in a while with a simple unused toothbrush. The safety measure that doesn’t allow you to close the butterfly doors until you align the blade perfectly is what you get with Vikings Blade The Chieftain Safety Razor. Most razors don’t have this handy feature. This product is made from only the finest heavy duty Swedish materials and is extra coated with chrome. These material make it heavier and more durable. To kick-start, your usage of this safety razor, the manufacturer provides you with a set of American-made platinum coated blades. Once you are done with one blade, it won’t take you more than five seconds to change it and load a new one. This is made possible due to the advanced head with the cut-minimizing system. Beginners will find an easy-to-follow guide with simple instructions very useful. However, providing that this razor is not forgiving at all and can cause some bad cuts, maybe you should find elsewhere until you get the hang of wet shaving. As an added bonus, there are a luxurious leatherette and suede carrying case and a mirror that you also get with this safety razor. The price may be a dealbreaker for some. A single cutting edge of Merkur Safety Razor is designed to cut the hairs smoothly, with no pulling, tugging, ingrown hairs and irritation. With this product, you get an extremely close and precise shave. Once you need the new blades, you won’t have to worry about replacing them because this razor uses universal, inexpensive ones. On top of that, its double edge blades are recyclable and don’t pollute the environment. One sample blade is already included in the package. The best of all, the razor comes with a long handle that has a non-slip and comfortable grip. It’s available in extra long length of around 4 inches or standard length of 3 inches. You can think of this safety razor as an old school because it has an iconic three-piece design just like the razors your father and grandfather have used. Unfortunately, this is precisely the reason why you will find the process of changing the blade annoying and challenging. A straight-cut, closed comb it comes with fits all standard safety razor blades. There is undoubtedly a technique to shaving with a safety razor. Following this process will help you to avoid ingrown hairs as well as an unsightly accumulation of nicks, scrapes, redness, or any other signs of skin irritation. If you’re a guy who happens to be accident-prone or otherwise tend to find your hands slipping a lot when shaving, you may also want to look into what is an alum block. What Is a Cartridge Razor? Less glamorous than their competitor – i.e. pretty much on par with displaying your best anti-dandruff shampoo for men on your bathroom counter for the world to see – cartridge razors are comprised of a plastic handle and a varying number of blades layered on top of each other. Although some earlier cartridges featured as few as two blades, many models these days, seen from brands like Gillette, feature a set of five. If you’re not willing to set aside the few extra minutes it may take to use a safety razor, or if you’re otherwise short on time, cartridge models can be convenient for getting the job done fast. You may not get the best shave, but it can be helpful as a short-term fix. While you don’t often spy a barber shavette in your average Walmart or Walgreens, cartridge razors are incredibly common, and sticking with what’s familiar sometimes just feels more comfortable. Plus, the pivot head found on most models means you don’t have to worry about cutting at any particular angle. Another perk of using this type of shaving tool is that it’s actually pretty difficult to cut yourself shaving with these. With quick swipes, there’s not as much precision that needs to be involved. Even so, it doesn’t hurt to have your natural beard soap on hand to ameliorate the discomfort that can be had with a dry shave. Replacement costs for cartridge heads are hefty and may set you back up to $200+ a year on refills. Compare that to the estimated annual cost of $13 for a safety razor. Cartridge razors are a little less fussy than safety shavers in that they’re pretty homogeneous as far as weight and size go. Some people will argue that this type of razor isn’t really for serious shavers, but that’s something you can decide for yourself. However, these can vary somewhat in price. Since the initial investment on cartridges runs for less than that of your average safety, it’s probably better not to go with the cheapest variety you can find. This is practical for both getting a smooth shave and for shaving more sensitive areas on your body. Cartridges are easily available for purchase pretty much anywhere, including online and in subscription boxes. The breakthrough shaving system of Micro Touch Triple Blade Razor is based on the German-Engineered Precision tough blades that provide a comfortable shave. Made to provide a snag-free shave at any angle, this blade type is amazing for sensitive skin. For the price, you get a three blade system where the first blade lifts, the second one cuts and the third one finishes the process for a very clean shave. Tough blades are made to last up to 4 times longer than ordinary blades because each of them is coated with a micro-thin, non-stick surface that expands its lifetime. The non-stick coating prevents build-ups, while the smart spacing between the blades enables you to clean them easily with simple rinsing. By purchasing this product, you will be supplied for one whole year of shaving providing that there are 12 refill cartridges included in the pack. Although it’s slip resistant and gives you a good grip, the handle on this item is unfortunately very delicate and flimsy, so it tends to break easily. 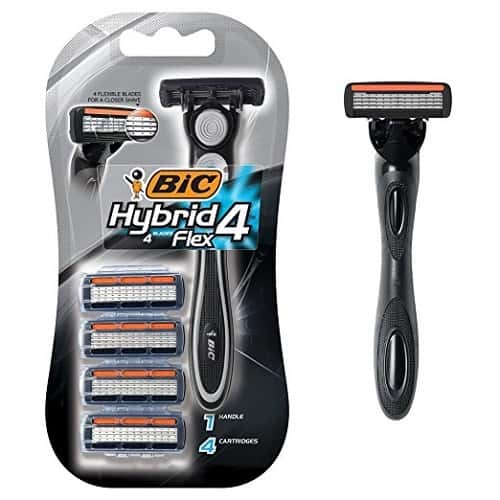 Each package of BIC Hybrid 4 Flex Razor comes with one handle and 4 cartridges at an extremely affordable price. Cartridges can’t be bought separately, which means you will have to buy the new pack as soon as you run out of them. However, the blades stay sharp for a long time, so you won’t have to deal with purchasing the new ones too soon. The blades themselves are flexible and individually adjust to the contours of your skin, leaving it feel ultra-smooth. There’s also a lubricating strip with aloe and vitamin E to enhance the glide. 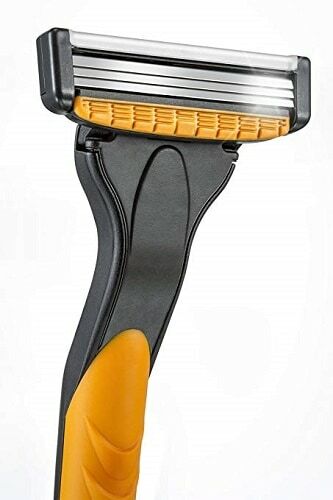 Yet another excellent feature is the ergonomic handle that provides you with a superior control while shaving thanks to its textured and comfortable grip. To ensure that the blades stay close to the skin while you shave at different angles, these cartridge razor has a pivoting head which adjusts to your movements. When the times for changing the cartridges come, just press the button to eject the used one and click in the new cartridge with the lubricating strip at the top. 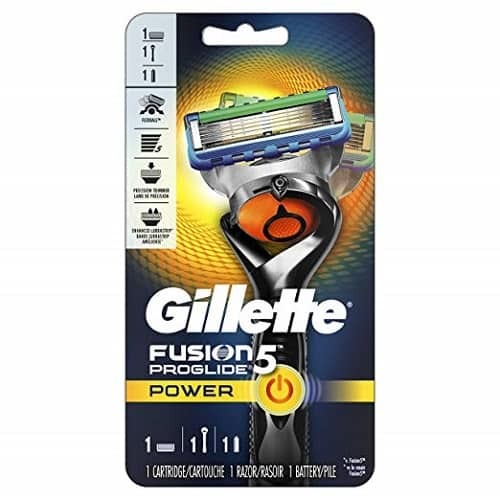 Using the thinnest and finest, anti-friction blades for which it is known for, Gillette Fusion5 ProGlide Power Razor doesn’t pull or tug your facial hair’s at all. Its original FlexBall technology pursues the contours of your face perfectly, getting to each unwanted hair and cutting it with ease. The enhanced lubrastrip now has more lubricants making the blades glide effortlessly across your skin. These are the premium blades, so they will remain sharp for many shaves or more precisely for up to one month of shaves. Although more costly, its longevity makes it a bargain deal in the long run. MicroComb is a nice addition and can be used as a guide when shaving. On the backside, there is a precision trimmer that works amazingly well for those hard-to-reach areas. Rotating head helps in keeping the razor follow the lines of your face, while the vibrating handle is something you do not meet every day on this type of products. However, besides massaging your face when shaving, it doesn’t have any particularly useful purpose. Furthermore, it’s very slippery and therefore easy to drop and break. Shaving with a cartridge is pretty straightforward, which is part of its allure. You can prep the area you’re attempting to shave with gel or shaving cream, or even go at it dry if you’re less concerned about redness. The way the pivot point of the heads is designed allows users to maintain a generally constant angle while making your passes. Hold your device loosely, and try to avoid making short, compact strokes. Both cartridges and safeties need to be cleaned as well as regularly maintained in order to consistently get good results. This also includes replacing blades and cartridges as necessary. As briefly broached above, replacement blades for safeties run pretty cheap at usually no more than ~$0.35 a blade. With cartridges, however, you have to replace the whole head, and the regularity with which you will have to do that, as well as the price of each of those purchases, is pretty pricey in contrast. The main issues to attend to in maintaining either device is clogged blades and a dulling of the blades. To some degree, both are inevitable – particularly with cartridges – but it’s easier to watch out for the clogging. As far as keeping your blades sharp goes, they will eventually dull. There’s nothing you can really do about that. The time it takes for that to happen though will just depend on the brand you’re buying from, how often you’re using your razor, the coarseness of your hair, etc. Photos from: IgorVetushko / depositphotos.com, nejron / depositphotos.com, darknula / depositphotos.com, Cosmin35 / depositphotos.com.